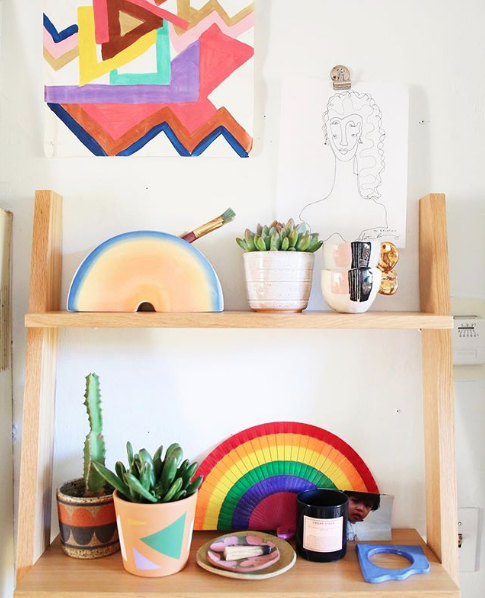 We’re big fans of makers who create vibrant pieces of art as well as joyful spaces to make them in. Exhibit A: Kristina Bing. 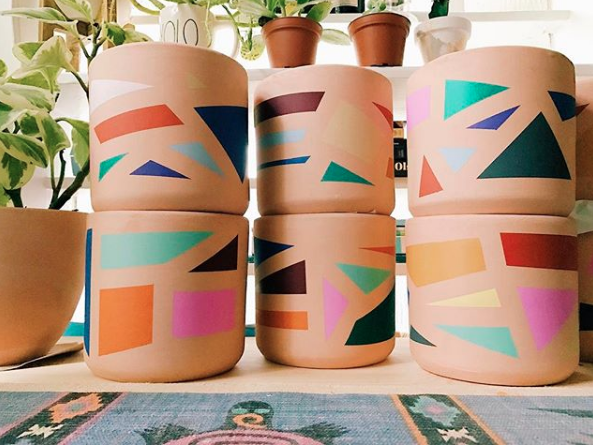 Kristina’s pottery is colorful, organic, simple, and fun. 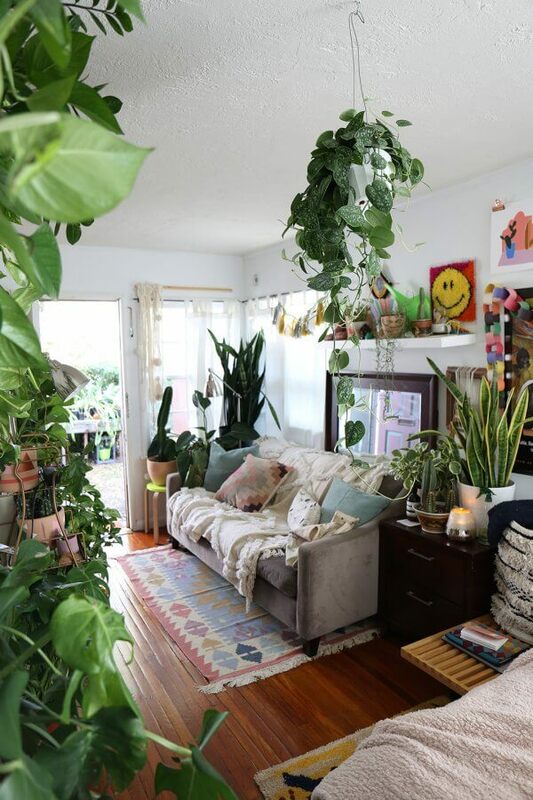 Her home is a dreamy escape of greenery, optimism, and extreme comfort. 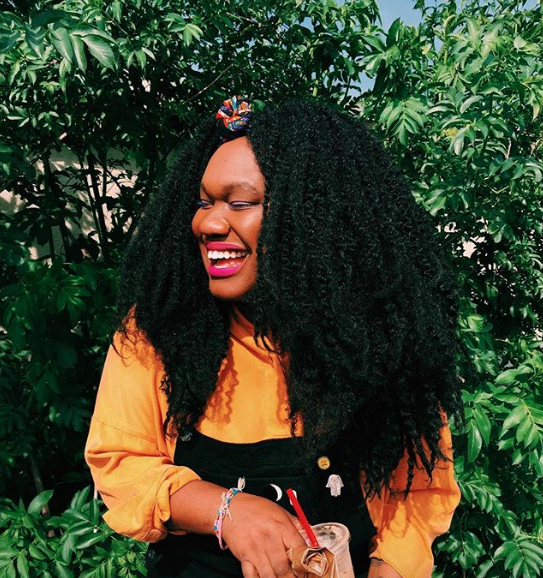 Read on to find all her favorites, and how she turned unemployment into a season of creative expression. Tell us a little about where you’re from, where you live, and what you do for a living. I’m from San Diego and I currently reside in Los Angeles, Ca. I work for Justina Blakeney at Jungalow as her E-Commerce Manager. When I was younger I wanted to work for a magazine and ended up going to college at FIDM because that was my ultimate dream. I ended up getting my degree in Merchandise Marketing (which is a degree in buying) and had Merchandising and Visual positions at every retailer you can think of. I don’t think I’ll ever know what I want to be when I grow up — but I do know my current dream is to be well rested, focused, and positive 24/7. 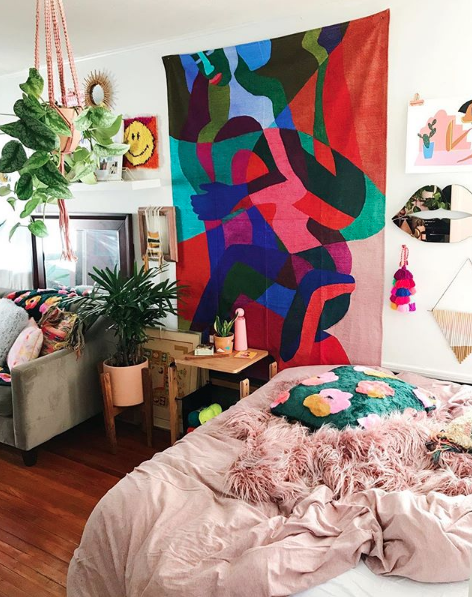 My dream house is filled with plants, laughter, good light and beautiful art. 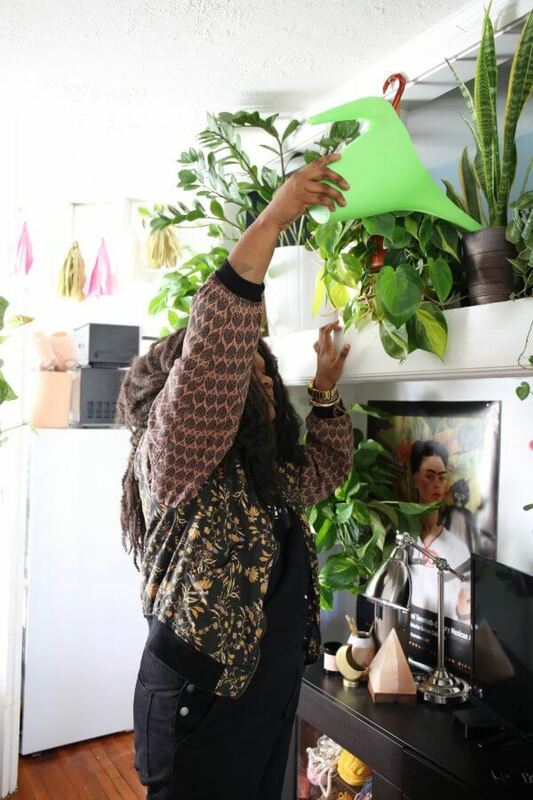 Plants are a huge and gorgeous part of your home. Have you experienced any surprising benefits from bringing the outside in? Plants are the best medicine! Honestly bringing the outdoors in can only bring you positive energy. You’re learning to adjust and care for a living thing that may be temperamental. Also, they are really beautiful to look at so waking up and seeing your home filled with mother nature’s gifts — you can’t get any better than that. 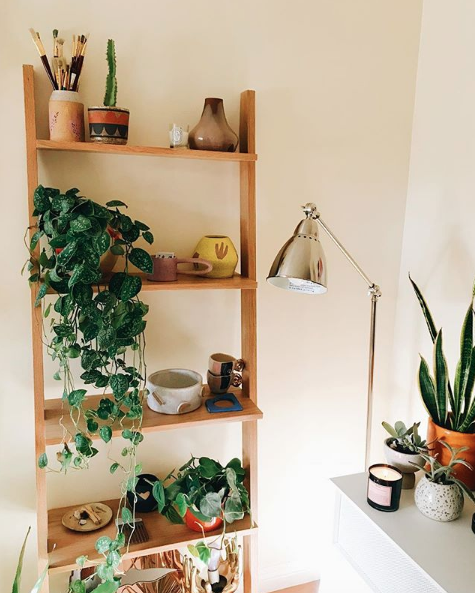 Could you recommend a few of your favorite kinds of houseplants for our readers? It all depends on lighting! I just bought my third Fiddle Leaf Fig and we will see if I can keep her alive this round. It’s all about learning what each plant needs in order to survive. I say do research on high/low light plants and pick a plant based on that! I’ve totally done the whole, “Well this is a high light plant but maybe I can make it survive in this dim corner,” and it never works! Your pottery is so fun and matches everything. Do you plan out your colors or is your process more organic? I started painting pots when I was unemployed and trying to get my creative juices flowing and it ended up being a bigger thing than I had planned for. All of them are organic and no two are the same. What textures are your favorite to liven up a space? All I care about is soft bedding and pillows because I always want my bed situation to be 100% comfort since I’m having all my dreams here. What new things are you learning or experimenting with in your art right now? I’m learning that I have to keep challenging myself to think outside of the box and not be too stagnant with one design. For more of Kristina’s work, follow her on Instagram. Thanks for sharing, Kristina! All images courtesy of Kristina Bing and Sheewa Salehi. I love the eye candy! Am loving your book Ingrid. I live a block from a gorgeous lake with walking and biking me paths, which goes by the Rose Garden and Peace Park ( in Minneapolis ). I am in the Rose garden because of you – and I can’t believe I don’t go here more often. I’m a Buddhist practioner but your book is a good reminder for me to focus on the joy I get in the outer world as well. Thank you, Diana! Appreciate you reading and letting me know. And that is so wonderful to hear about the Rose Garden!